Northwest United and Liga Tlaxtli partner for the 2018/19 season! It is with great pleasure that Northwest United FC can announce their official partnership with Liga Tlaxtli. As of the 2018/19 season Northwest United FC (NWU) and Liga Tlaxtli will partner to provide more opportunities for our local players and community to maximize the talent in the valley, and therefore create a pathway for each player to achieve their goals. This partnership was made to achieve several key objectives. Our main objective is to bring the soccer community of Skagit County closer together to reach common goals and also to be able to provide solid platforms for our young and aspiring athletes in the valley and surrounding areas. La Liga has evolved into a fantastic local recreational club in the valley thanks to the work of Salvador and Erica, with so many talented players coming through their program. With that, another key objective will be for NWU to identify top talent in the league and guide them into our program where they can develop in the sport and present them more opportunity. The idea being they can continue to play in the local league with Tlaxli whilst playing at the premier/ select level here at NWU. NWU will provide the highest levels of play, coaching and continued development of Soccer in Skagit Valley as we aim to assist the needs of La liga with providing coaching education and resources. More access to our club will benefit their coaches, which in turn will filter down to the players. 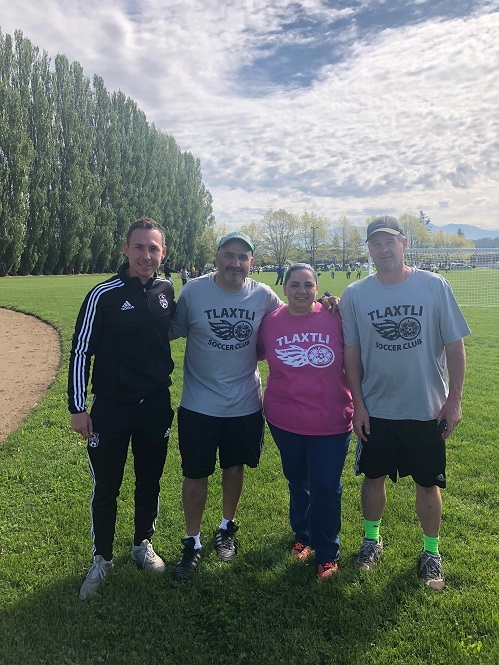 Kristian Powell, Director of Coaching of Northwest United FC said, "Liga Tlaxtli's primary focus of inclusion and player development made them a natural choice as a partner. Working closely together we will identify and provide opportunities for players to progress into our club as well as guide them into programs such as EPD, Sounders Discovery and the Sounders Academy, as well as providing players with the necessary resources for opportunities to the play at the college level. We currently have players who have utilized both programs and are now full time players at the Seattle Sounders Academy or on route to playing high level High School/ College Soccer. I am absolutely positive this number can and will increase with this partnership and will facilitate more and more kids moving on to these levels. Another factor is the clear benefits it has had on the individuals being part of the NWU program that builds our core values, character, integrity and learning to work in a team that transcends to the boys and girls in their everyday life. It is an exciting time for the club and community "
Northwest United and Liga Tlaxtli will remain unchanged as we know them today. The partnership will serve to provide club resources, curriculums, combine and share players at all age groups to raise the level of soccer in our community. Additionally, clubs will benefit from a larger collective pool of talented players as well as high quality technical training and coaching. We're thrilled to be a part of this exciting new partnership that will provide players the opportunity to achieve their dreams! - Northwest United, unidos podemos!